Caley Thistle defender Brad Mckay. 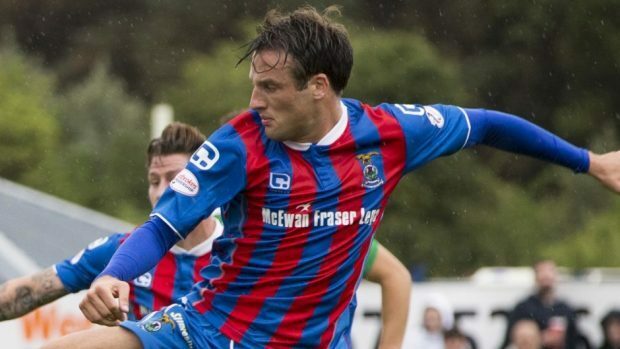 Caley Thistle defender Brad McKay has hailed the Inverness squad’s collective desire to play through the pain for the benefit of the team ahead of today’s Premiership Premiership trip to Kilmarnock. The Highlanders have suffered horrendous luck with injuries in recent weeks, with McKay one of several defenders to have been sidelined, after being stretchered off with a shin injury in last month’s 3-1 defeat against Aberdeen. Caley Jags were also forced to play last weekend’s 1-1 draw against Hamilton Accies without a fit goalkeeper, with Owain Fon Williams playing despite suffering back spasms. McKay feels manager Richie Foran is blessed to have so many players prepared to play for the cause despite not being fully fit. He said: “It’s one of these squads that is tough. Everyone is looking after each other – they’re asking you how you are when you’re injured. We came in after the Hamilton game really disappointed not to have picked up three points. On the flipside, it’s a good point considering that boys aren’t fit. Boys are playing through injuries, being 50% or 60% fit. “They don’t want to let anyone down and, more importantly, not letting themselves down. If you can give something to the team, even if its 45-60 minutes then you’re done, that’s what a team is. It’s a squad that is going to do well. McKay returned to the side for last week’s game against Accies but admits he rushed himself back ahead of schedule given the need of his side and the 23-year-old added: “The initial impact was on my shin but the swelling went down to my ankle. I’d ended up damaging ligaments in my ankle, which is why it took so long to heal. I had to be careful and time it right.